Is it Western Australian pitcher plant, Cephalotus follicularis (family Cephalotaceae)? Yes, yes it is. Since there are no points available to me I won't go into any sort of exposition about it - other than it is one of my favourite little plants and I once spent a fruitless day in the Albany district searching for a wild one. It would seem that this is not a 'true' pitcher plant (i.e., not closely related to the Nepenthes species), but rather a convergently evolved, SW Australian endemic insect-eating plant. Incidentally, in spite of being insectivorous, Cephalotus follicularist seems to have a symbiotic relationship with the peculiarly-named fly Badisis ambulans, the larvae of which develop in the plant's pitchers. I thought it was Nepenthes, for the structure of the perisome and the lid, but these are not on a tendril. Going to guess Nepenthes, family Nepenthaceae, anyway. Bother, late to the plant ID again. 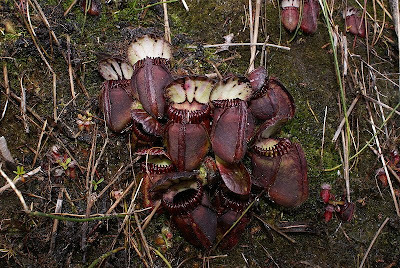 The character that distinguishes it from all other pitcher plants is that the petiole is at the top of the pitcher joined to the back of the rim of the trap, not at the base of the jug as with the other families. Should mention that it is a family (Cephalotaceae) with only one genus with only one species. You are going to have fun with the taxonomic history of this one. The name presumably means "head-ear", what other sort of ear is there? I should have said vegetative characteristic, obviously the flowers would be a give-away as well. The Oxford English Dictionary does not solve the question of which is the true pitcher plant, the definition covers all the families. 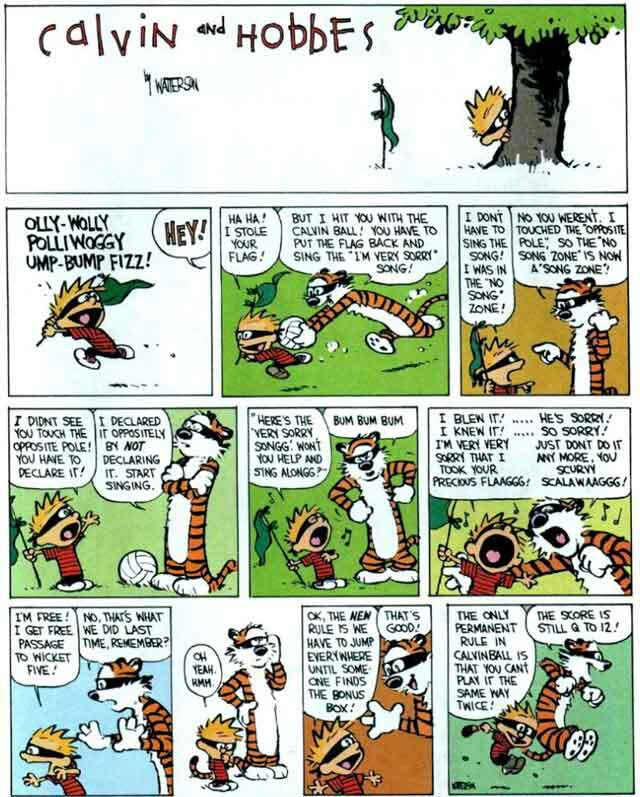 The first quotation refers to an un-named American plant. "1818 A. CUNNINGHAM in I. Marriott Early Explorers Austral. 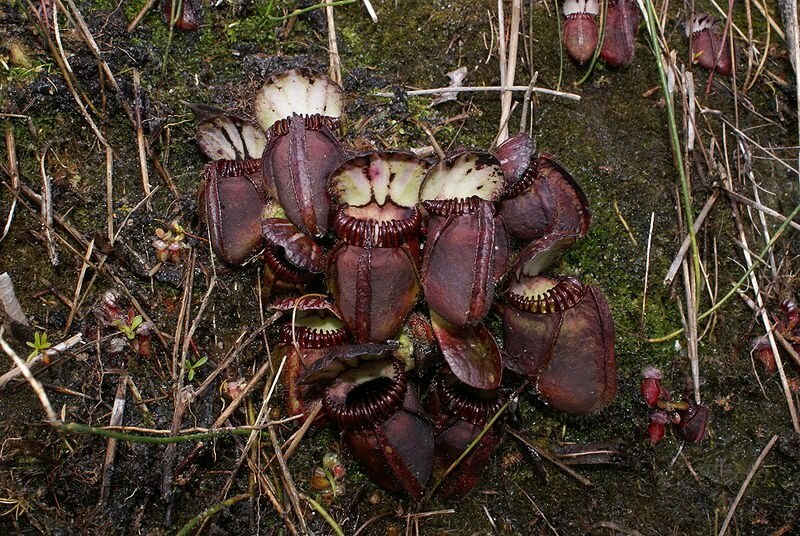 (1925) 31 Jan. 323, I made a diligent search for the curious Pitcher Plant, Cephalotus follicularis." "1835 J. S. HENSLOW Princ. Bot. I. §80 In the Nepenthes, or true pitcher-plant, the pitcher is placed at the extremity of a tendril, terminating a winged petiole. It is crowned with a membranous lid." That should be 16 years, as John Brown appears to have landed in Australia in December 1801 not 1800 as the "The curious world of carnivorous plants" by Wilhelm Barthlott et al stated. Robert Brown, sorry, should have been asleep hours ago. Three points to Pat (who obviously really wanted them); two to Dartian; one to Ted. Hmm... it would seem that this game has some rather interesting rules. Perhaps this may explain things. Yes! I really wanted them and thanks. Sorry, beetlesinthebush, but stealing by giving the distinguishing characters is in the rules. "For some reason commenting on your (and several other peoples) blog doesn't work for me but, if you're ever down near Albany (actually closer to Denmark/Walpole) again then I can probably give you directions to a good site to see Cephalotus in the wild. I've seen them in two locations once in 2001 and again nearby at a better spot in 2008. The 2nd site is possibly where the WIKIPEDIA picture came from, I've got similar photos."